Those of you on the farm or driving past this week will notice a big change: construction of a high tunnel (also know as a hoophouse) has begun! 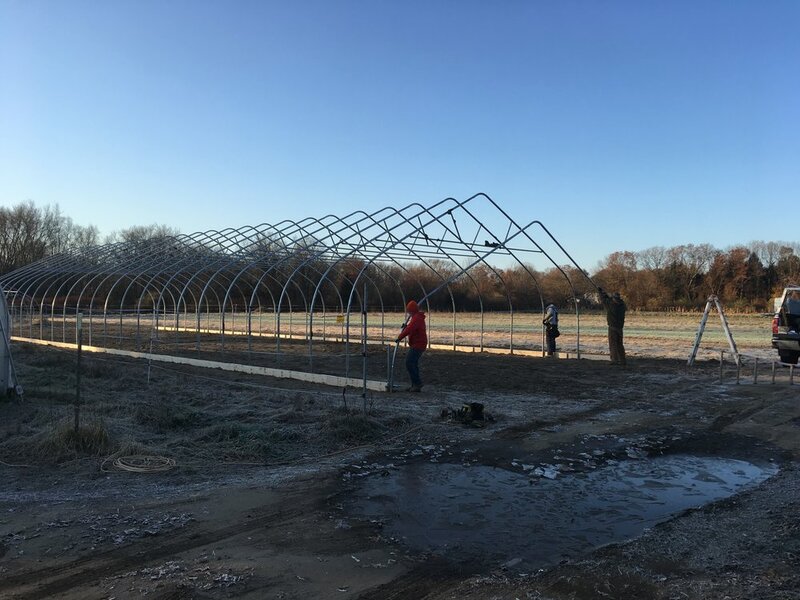 We received a grant from NRCS to build a high tunnel on the property and since we are still busy harvesting, we hired the folks at Adam’s Greenhouse to build it for us. The work they’ve already accomplished in a day and a half would have taken us several weeks (especially since we would have to juggle the high tunnel construction with harvesting and putting the farm to bed for the winter). The new structure will allow us to grow tomatoes in a protected environment. The benefits include increased yields per square foot, protection from disease, earlier and longer production, as well as improved fruit quality. You can imagine we are very excited about this new development! You can see a smaller structure behind the main high tunnel. This is a structure we are constructing ourselves from used parts we purchased from another farm. We will finish the smaller house this spring and hope to plant our first crop of ginger! We have ordered seed from Hawaii and are excited to try out this flavorful, heat loving crop next year. Before we get too caught up in plans for next year, don’t forget those of you in the Late Fall CSA have your last pick-up this week (Thursday 11am-6pm or Saturday 9am-3pm) and Fall bulk order pick-ups will be Saturday from 9am-3pm. Look for monthly farm updates from us throughout the winter, as well as more info soon about a December farm stand pop-up (likely December 8th)! Watermelon radish - These tasty radishes are white and green on the outside and red inside, making them a colorful addition to winter salads and sliced veggies for dipping. Shallots - This relative of the onion has a flavor of red onion with a hint of garlic. Transitional. Salad turnips - They are less spicy than radishes and sweeter than purple top turnips making them great for eating raw in salads. They can also be lightly sauteed, with or without their greens. Black futsu pumpkins - These pumpkins are a dark color while growing in the field but now that they are ripe they are orange inside and out! Transitional. Lettuce - These mini heads are the last salad greens of the season! Potatoes - Both Peter Wilcox (purple skin, yellow flesh) and Elba (yellow skin, white flesh) this week. Transitional. Start by getting that squash in the oven. Preheat your oven to 400 degrees and arrange your squash pieces (skin on) in a single layer on a large baking sheet. Toss them in your olive oil, salt, pepper, paprika, cinnamon and cayenne until evenly coated. Transfer to the oven for about 35-40 minutes or until the squash has softened and easily peels away from the skin, rotating halfway through. Meanwhile, get your rice started according to package instructions. Add your cloves, fennel seeds, salt and pepper to taste and just a touch of olive oil. As always, I'm super partial to the jasmines or basmatis. I don't know, they just add a little something extra and make the food feel a little fancier, plus they pair beautifully with the headier spices like cinnamon and cloves. In a small skillet over low heat, add your (rinsed and dried) pumpkin seeds. These will toast up quickly and can burn if you don't watch them closely. Stir them often until just barely browned, then remove from the pan and set aside. When the rice is just about done, stir in your chopped kale. You want to just wilt it down, not cook it, so wait until you're just about ready to serve. Toss in your golden raisins. Serve alongside your beautiful slices of black futsu and top with your toasted pumpkin seeds. You could peel the skins off of the pumpkin before serving, but that way you may risk losing a lot of the glorious goodness within them (and the skins are edible!). In large mixing bowl, lightly beat eggs, then whisk in flour. Press potatoes and onion to extract as much liquid as possible, then add to egg/flour mixture. Season with salt and freshly ground black pepper. Using wooden spoon or hands, mix well, but do not overwork. Using paper towels, carefully wipe out pan. Add 1 tablespoon oil and 1 tablespoon butter and fry 4 more pancakes. Repeat with remaining batter, wiping out pan and adding 1 tablespoon oil and 1 tablespoon butter before each batch. Preheat the oven to 375°. In a 9-inch cake pan, drizzle the garlic with the oil. Cover with foil and roast for 40 minutes, until tender. Let cool, then squeeze out the cloves. Mash the garlic to a paste and transfer to a saucepan. Add the half-and-half, thyme and rosemary and bring to a boil. Simmer over very low heat until reduced to 3 cups, 20 minutes; season with salt and pepper.